In fifteen weeks’ time, the first ever edition of Shoptalk Europe will take place: from 9th – 11th October in Copenhagen. Shoptalk is unlike many other events. It is focused on disruptive trends, technology and changes that in how consumers view and buy things. It is this very focus that makes it a unique event and one I find extremely appealing, personally speaking. It could not be more in line with what I have described in my book ‘The End of Online Shopping’ (on its way to the 4th print run in NL, with an English edition expected very soon!). Shoptalk Europe expects to welcome over 2,000 retailers and brands in October. It is impossible that you have missed the pan-European marketing campaign with the fun cartoons. Shoptalk Europe is being launched hot on the heels of successful Shoptalk in the United States – which took place in 2016 for the first time, welcoming 3,100 people and growing to 5,500 attendees this March. As an ambassador for Shoptalk, I would like to invite you to purchase an event ticket at a discount, or to take part in the free Hosted Retailers & Brands Program (including a free ticket and up to €650 towards travel and accommodation expenses). I am thrilled to announce that I have been selected as one of the speakers at Shoptalk Europe. Over 100 speakers have been confirmed, including the CEOs and executives from retailers and brands such as Tesco, Otto Group, H&M, Ikea, Galeries Lafayette, Metro, Mars, Dollar Shave Club, Estee Lauder Companies and many others. In the past weeks, the Head of Amazon Prime Europe has joined their ranks. You should check out the Linkedin post by Zia Wigder, the Chief Global Content Officer of Shoptalk. Or take a look at the impressive up-to-date-link of speakers – due to grow to 250 speakers by October. Sure, you could just purchase a regular ticket. If you use my discount code (JONGEN150) you can save €150. Use this link with discount to buy your ticket. On the other hand, you may qualify for a free Shoptalk Europe entrance ticket, and up to €650 in expenses for travel & accommodation, in exchange for eight 15-minute meetings with Shoptalk sponsors and exhibitors. Don’t worry: all the meetings will be aligned with your chosen preferences and interests. At the moment, over 150 businesses have signed on. They include representatives from John Lewis, Nike, Ralph Lauren, Tumi, Nestlé, Bugaboo, Dixons, Kellogg, Zalando and more. You can read all about Hosted Retailers & Brands Program and register for the program. Your associates can join in with the program too, and get a free pass to attend Shoptalk Europe and have their travel & hotel expenses covered. 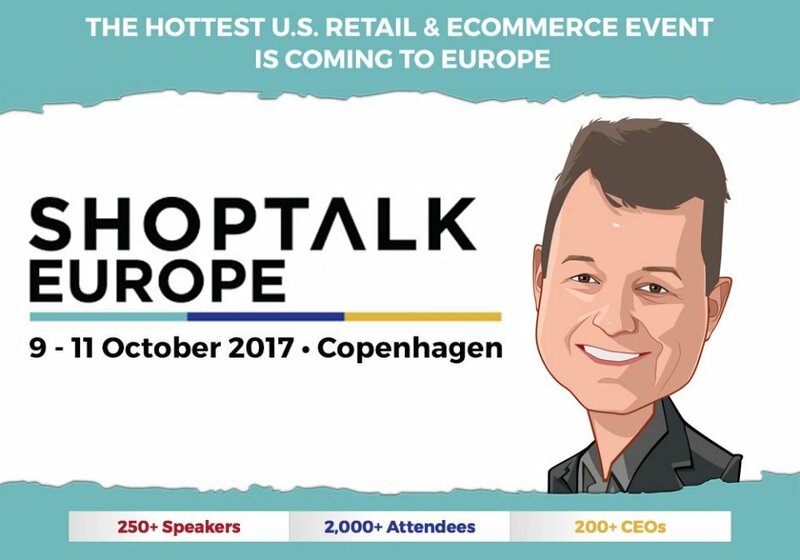 Shoptalk Europe, from 9th – 11th October in Copenhagen is bound to be a fabulous event for retail and ecommerce. I hope to see you there!